投稿者: 事務局 in お知らせ 投稿日: 2018 年 2 月 14 日 . Are you interested in research, collaboration and travel opportunities in Japan? Hundreds of attractive funding opportunities are available to all fields (social-science, humanities, STEM, multi-disciplinary) for research at all Japanese Universities and public research institutions. 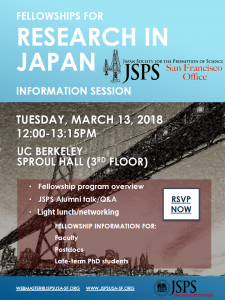 If you want to know more, don’t miss this rare opportunity to learn about funding options directly from the alumni and staff of Japan Society for the Promotion of Science (JSPS)*. *JSPS is the largest research-funding agency in Japan, under the auspices of the Japanese Ministry of Education.